“The harvest has been ruined for many farmers”. In 2016, the South Halmahera Agriculture Agency paid a visit to Gane. Farmers complained at the time about the plague of parasites. Unfortunately, the government has still not come up with an adequate response for further action. Last week, in the Dou Kafi retreat, in Tidore Island City, the two men represented the Gane Dalam village, and together with Walhi North Maluku they met with Transformation for Justice (TuK) Indonesia. They reported the latest developments since Korindo was urged to impose a moratorium on clearing land of high conseravtion value in its 11,003 hectare concession, in the South East Gane and South West Gane sub-districts. Since 2016, nearly all the community’s trees and other crops have been damaged by the rhinoceros beetle attack. “This rhinoceros beetle eats the stalk or midrib of the coconut fronds that we call mafafa. After the rhinoceros beetle makes holes in the midrib, then a different beetle eats out the inside”, Sanusi said. Andre Roberto, the Korindo Groups General Manager for HRG and GA, confirmed that these invasive beetles had attacked the company’s oil palm plantation in Halmahera, and had also entered the community’s coconut farms. The beetle pests, he said, were not a new thing and often attack coconut farms throughout Indonesia. Andre said that the company was analysing the infestation with experts from the Centre for Oil Palm Studies (PPKS) in Medan and were trying to use pheromone traps to overcome it. Based on the results of the PPKS’s analysis, in the near future the company will help coconut farmers in Gane use pheromone traps as an effective and environmentally-friendly way to overcome the problem. The start of a smallholder scheme. Although the problem of ruined harvests caused by the beetle is still not resolved, the Gane Dalam community is having to face plans to clear more land for a smallholder plantation scheme known as plasma, which will cover 2900 hectares. The majority of the community are against the scheme because clearing new land will destroy their principal crops: coconut, cloves and nutmeg. The company has set up a core cooperative under the control of three village cooperatives in Yamle, Sekli and Gane Dalam villages for the plasma scheme. “The company has also offered to work together with the community to set up small kiosks to supply plantation workers”, he said. Responding the parasite attack causing problems for farmers, TuK Indonesia and Walhi North Maluku believe it is an impact from the large-scale forest clearance in the Gane Bay since 2011, carried out by PT Gelora Mandiri Membangun, a subsidiary of the Korindo group. They are still investigating this suspicion. “The most important thing is to find a solution to this problem. All stakeholders should take a position, especially the South Halmahera Regency Government.” said Ismet Solaeman from Walhi North Maluku. Ite, as Ismet is normally called, said that the majority of residents in villages in South West Gane and South East Gane lived by the shore. Timber exploitation further up the watershed had a direct impact on important community needs, such as water. The majority of residents in Gane Bay are subsistance farmers. Almost every household has a vegetable and root crop garden and a coconut farm. Copra is the main commodity. In Gane Dalam and neighbouring villages these coconut farms are often used as security against loose loans from businessmen. At harvest time, a portion of the proceeds from selling the copra and other crops is taken off to pay back the loans. Although the dominant culture is farming,the area is surrounded by sea, which also offers a great potential. Farmers will catch fish for their own needs only, to meet their families’ protein intake. To maintain and develop this model of local management, local people also take a series of steps to restore the environment and enrich the vegetation, replanting mangroves along the coast, where it had been deteriorating. They also have a nursery for crops which have an economic value for their families. In the seas around Gane Bay, stocks of grouper, kawakawa and tuna fish are all conserved. Most of the mangrove cover is still dense but in some of the seagrass meadows, coral whitening has been observed. Ite believes that policy for investment permits that use the land must be in synergy with spatial planning and the types of economic management which form the basis of local people’s livelihood. “which have so far managed both to support people’s income and follow principles of sustainability”. Why not support local commodities instead of oil palm? The previous Bupati of South Halmahera, Muhammad Kasuba, was wrong to issue a location permit to Korindo in the SW Gane, SE Gane and Joronga archipelago sub-districts. The topography of Gane Bay, Ite said, tends to be steep cliffs and there is already productive land used by the communities within the company’s concession. The end result is that the community, who used to be farmers, end up as plantation labourers on their own land. 1342 families in Gane Barat are dependant on non-rice agriculture. Based on data from South Halmahera statistics for 2016, each family owns between two and eight hectares, a total of 25,228.1 hectares. “It’s highly regrettable, that the government’s intense campaign for food self-sufficiency doesn’t fit with how sectoral policies are being implemented in the small island areas of South Halmahera”, Ite said. In a report from North Maluku Regional Disaster Management Agency into the prevalence of food security, based on the food security and vulnerability atlas, South Halmahera was a red zone (including all the island areas), indicating a susceptibility to food shortages. A decline in food security is based on nine indicators, including food availability, access to food, how food is used, and nutrition. Unfortunately, there is no support for the majority of types of community-based management at the village level. “Instead it is cut back or land is converted for oil palm investment. 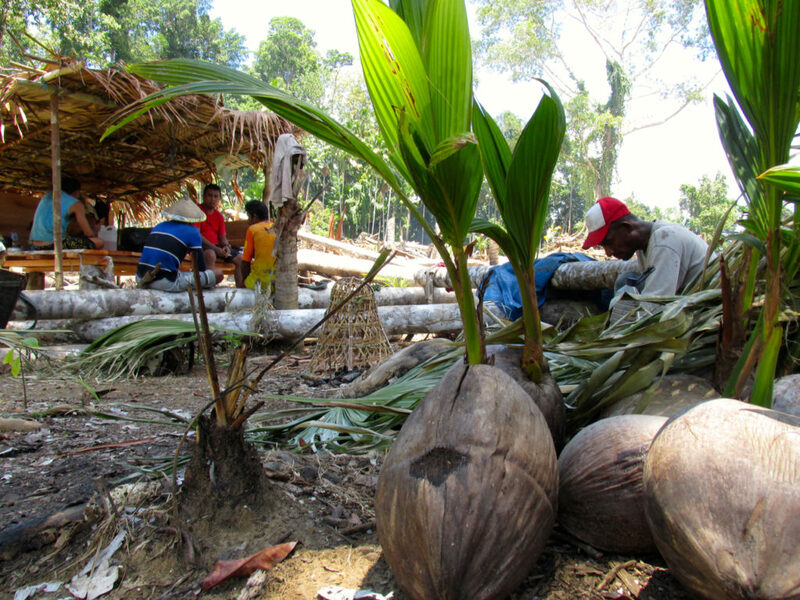 In view of all these community problems, Walhi and TuK, together with the Gane community, are asking the South Halmahera government not to award more concessions to oil palm companies and instead strengthen the sectors that have long formed the backbone of the community economy, such as copra, nutmeg, cloves and other food crops. This entry was posted in Around West Papua and tagged Korindo, PT Gelora Mandiri Membangun, Rhinoceros Beetle. Bookmark the permalink. Comments are closed, but you can leave a trackback: Trackback URL.